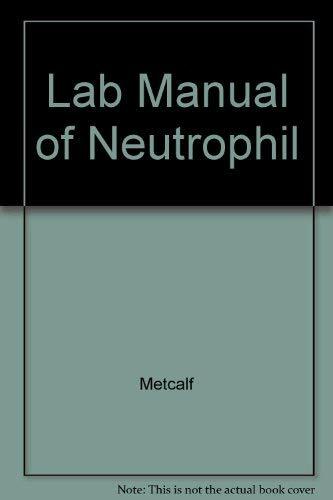 The Laboratory Manual of Neutrophil Function begins with complete instructions on the preparation of cells and materials for functional assays--the purification, counting, and viability testing of cells; the various procedures for staining cells; and the preparation of unlabeled particles, soluble stimuli, radiolabeled particles, and radioactive isotopes. The authors then describe the most useful and important in vivo and in vitro assays of phagocyte function. Coverage includes in vivo studies of neutrophil mobilization from bone marrow and of margination; in vitro studies related to diapedesis; studies of functions related to microbicidal activity; and studies of intracellular granule constituents. For each assay, the book reviews the underlying principles and rationale, details the procedures for performing and interpreting the study, and provides a range of normal values. Complete information on reagents and chemicals--and where these can be purchased--is provided at the end of the book. Metcalf, Julia A., Gallin, John I., Nauseef, William M., Root, Richard K.